“I am very excited about revisiting an old destination, in fact a very old destination,” enthuses award winning photographer and adventurer Mick Fogg, a veteran of 120 Kimberley expeditions. Mick will lead the experienced expedition team when specialist luxury and expedition cruise company PONANT explores Australia’s own Kimberley region in 2017 for the first time. Four 10 night voyages between Darwin and Broome / Darwin Darwin are scheduled between July and September 2017. 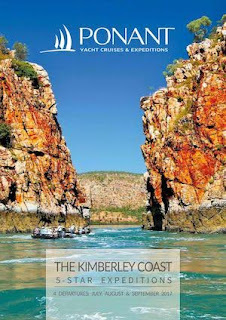 “Larger than 75% of the world’s countries, the Kimberley is a national biodiversity hotspot, listed in the top 3.7% of least impacted marine environments worldwide.” Comforting then to know PONANT guests will be exploring the region on an internationally recognised environmentally accredited ship, L’Austral, the youngest and most modern ship in the region. Modern in design and construction, all four PONANT sister-ships, comprising the youngest fleet in the world, feature the very latest in maritime technology, including 3D sonar for seabed vision, a dynamic positioning system to avoid dropping anchor in sensitive maritime environments, and electric propulsion for reduced emissions. PONANT’s Kimberley itineraries include classic must-see Kimberley highlights - the Hunter River, King George Falls, Mitchell Falls, Montgomery Reef and Horizontal Falls, as well as a number of rarely visited other destinations. 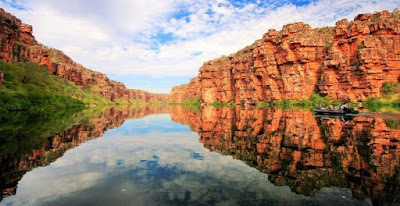 Depending on tides and weather conditions it may also be possible to visit Langii, spiritual home of the Wandjina, and Freshwater Cove, where guests will spend a very special day with Kimberley Elder Donny Woolagoodja, whose giant Wandjina artwork featured at the opening ceremony of the Sydney 2000 Olympic Games. 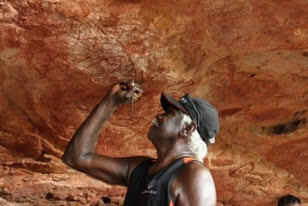 “Visiting these mystical places is enhanced when in the company of the indigenous caretakers. Hearing age-old dreamtime stories, while in-situ, and having the opportunity to ask questions adds perspective, an important dimension to the experience”. “In so many ways these are unforgettable voyages that will etch indelibly into your memory. A place all Australians should see; as captivating as Uluru, as spiritual as Kata Juta, this is the very essence of Australia” concludes Mick Fogg. L’Austral’s compact size and manoeuvrability will allow the ship to get close to shore before launching her fleet of 14 Zodiacs. The perfect ‘search engine’ for expeditions, the Zodiacs will provide access for exploring bays, mudflats and mangroves, venturing beneath vertiginous waterfalls, probing rivers carving through sandstone walls of dizzying heights, and viewing heaving emergent tidal reefs. Back onboard the mobile base camp, L’Austral, creature comforts prevail. Enjoy French luxury and ambiance, and experience the difference small ship cruising offers. Cool off in the swimming pool, enjoy spa therapy to ease tired muscles or simply as a pampering indulgence. An inclusive Open Bar provides guests the chance to relax with a beer, wines, champagne or, perhaps, a cocktail. Later, the choice of fine cuisine, the flavours complimented with world-class wines. All in all a very civilised way to travel, imbued with PONANT's trademark dash of panache. Award winning wildlife photographer and adventurer Mick Fogg has led more than 120 expeditions through the region in the past 15 years. He will be joined by a group of 12 experienced marine biologists, naturalists and conservationists including Darrin Bennett, Harry Christensen, Mark Watson, Brad Siviour. Darwin / Darwin: 1 departure - September 1, 2017. All 10 nights duration. PONANT Early Booking Bonus of up to -30% currently available from $5980 per person, twin share in Superior Stateroom.